The fireworks were on July 4th, but graduate transfer Geno Crandall’s decision Thursday to commit to Gonzaga had Zags fans celebrating again – leaving Gophers faithful disappointed. Crandall, a former North Dakota and DeLaSalle guard, announced his decision on Twitter. His other finalists were Minnesota and Xavier. The 6-foot-4, 180-pound senior is expected to graduate this summer and become immediately eligible to play for the 2018-19 season. Why did he pick the Zags? "Chance at a national title," Crandall told the Star Tribune. "And I think they've got a proven track record of developing pros and getting guys contracts." The two-time All-Big Sky Conference performer averaged 16.6 points, 4.3 rebounds, 3.6 assists, 2.1 steals and shot 41.7 percent from three-point range as a junior last season. 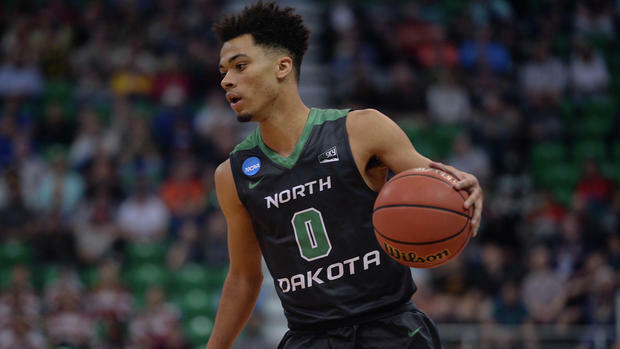 Crandall averaged 15.5 points and 4.4 assists as a sophomore on North Dakota’s first ever NCAA tournament team in 2017. The Minneapolis native played on three state championship teams at DeLaSalle, including with former McDonald’s All-American Reid Travis their senior year in 2014. Travis, who started his college career at Stanford, left the Cardinal to join Kentucky as a graduate transfer this summer. After receiving only two scholarship offers out of high school, Crandall was a highly sought after grad transfer as well last month. He took official visits to Xavier and the hometown Gophers, but was sold on pursuing a national title with Gonzaga after his trip to Spokane last weekend.
" I'm excited to be a part of the Gonzaga family and look forward to leaving my mark by helping this team in whatever way I can to reach our goal of hanging a national championship banner in the Kennel," Crandall said in a release. "I'm expecting a special year in Spokane and can't wait to get started." Even before landing Crandall on Thursday, Bulldogs coach Mark Few had a projected top-10 team in early preseason rankings. The Zags were 32-5 and reached the Sweet 16 last season. They return starters Josh Perkins, Zach Norvell Jr. and Killian Tillie, along with their top NBA prospect Rui Hachimura. "We are excited to have Geno join our program," Few said in a statement. "We were able to see what he is capable of doing earlier this season in our game versus North Dakota. He will be a great addition." The Gophers lose out on Crandall, but they return All-Big Ten forward Jordan Murphy and a talented backcourt of Amir Coffey, Dupree McBrayer and Isaiah Washington. Their 2018 recruiting class includes freshmen Daniel Oturu, Jarvis Omersa and Gabe Kalscheur. Richard Pitino, who finished 15-17 in his fifth season in 2017-18, still has one scholarship remaining for next season after 7-foot senior Matz Stockman transferred to Cal. Pitino could use more backcourt depth behind Washington at point guard, but he added Wisconsin-Milwaukee grad transfer Brock Stull, Vanderbilt transfer Payton Willis and Pittsburgh transfer Marcus Carr this spring. Willis and Carr will sit out next season due to NCAA transfer rules. Stull, a 6-4 guard, will join the Gophers in August after finishing his remaining classes and graduating this summer.